A hilly 105 kilometre (65 mile) ride from Mytholmroyd, into the Ribble Valley, taking you from the heart of West Yorkshire over the hills into Lancashire, and back again. There is a generous time allowance for completion – a minimum average speed required of 12 kph and a maximum of 24 kph, giving an upper time limit of 8 hours 45 minutes for completion. Mytholmroyd – Hebden Bridge – Heptonstall – Burnley – Fence – Sabden – Clitheroe – Waddington – Slaidburn – Grindleton – Chatburn – Downham – Nelson – Heptonstall – Hebden Bridge – Mytholmroyd. A contour count by Steve Snook (thanks, Steve!) suggests that there is a total of 2555 metres of ascent which makes the event worth 2.5 AAA points. Click on the green ‘Tickets’ button at the top of the page. This will take you through to the Audax website where you can find entry details. 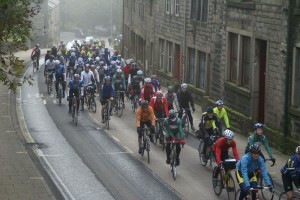 The event forms part of the Calderdale CTC Events Programme and is registered with the Cycling UK Tourist Competition. There is an entry fee of £5.00 for members of Audax UK or Cycling UK. In order to obtain public liability cover, people who are not members of these organizations need to take out temporary membership of Audax UK. Full details are on the entry form. There will be refreshments available at the start, and food available at the finish of the event. The start and finish will be at our event HQ at Mytholmroyd Sports and Community Centre, on Caldene Avenue, Mytholmroyd, just off the A646 and approximately 1 mile from Hebden Bridge, which has a large car park and is also easily accessible by rail (cycle-carrying trains stop hourly at Mytholmroyd from both Leeds and Manchester, and more frequently at Hebden Bridge). Anybody intending to take part who requires accommodation in the area either before or after the event should contact the Tourist Information Office in Hebden Bridge (01422 843831). There is also a Youth Hostel at Mankinholes (01706 812340), approximately 4 miles away. If you have any problems obtaining accommodation or if you have any further queries, please feel free to contact me, either by email, or by phone (01422 832853). We look forward to seeing you on the day. Photos from previous years. Please let me know if you would like an uncompressed version of any of these. The randonneuring organisation responsible for worldwide validation of qualifying rides for Paris-Brest-Paris. The national organisation for long-distance cycling in the UK, with details of rides from 50km upwards. Organised every 4 years, this is the largest long distance cycling event in the world.